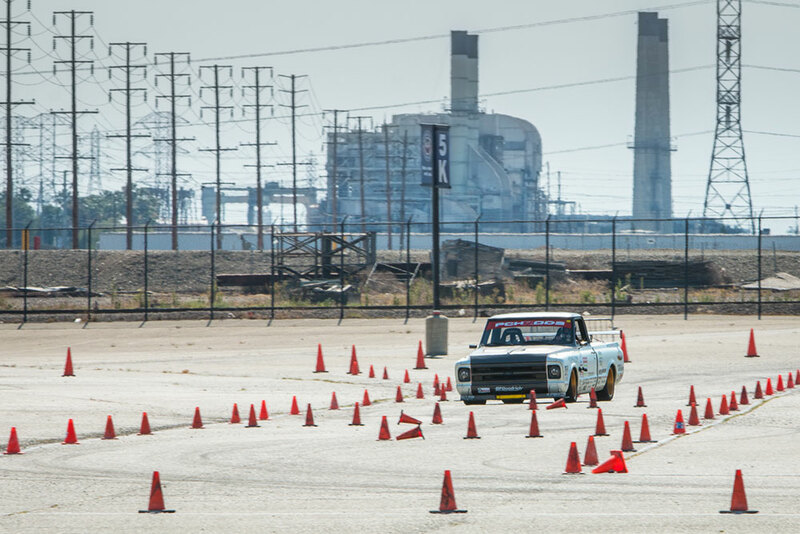 The NMCA West Hotchkis Autocross is one of the only pro-touring race series that acknowledges trucks as an individual class. Ever wonder what it takes to navigate a 4,000lb brick around a racecourse made from cones and win? 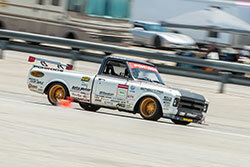 Spectre Performance driver Brandy Phillips did just that in the PCHRODS C10R at the NMCA West Hotchkis Autocross. 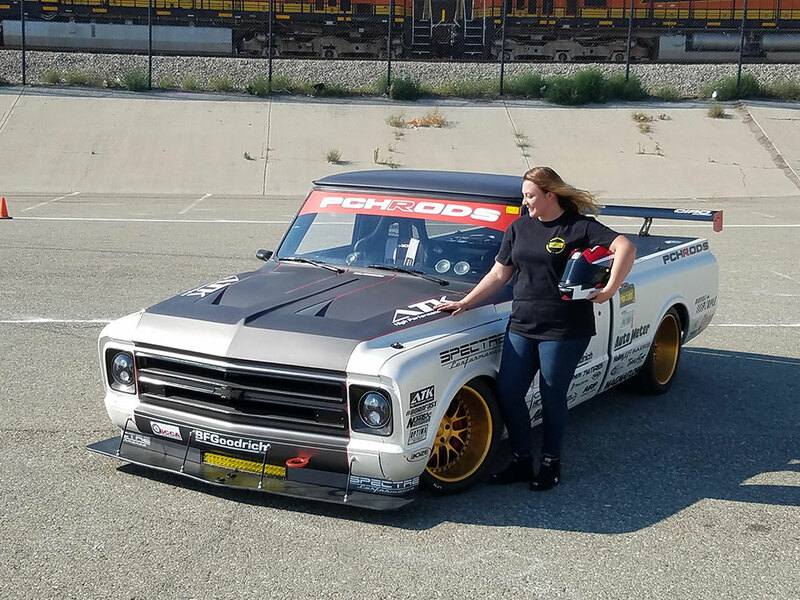 Though racing is not new to Brandy, sitting behind the wheel of the PCHRODS C10R has not come natural as she takes to her second year racing the truck in the pro-touring race series. 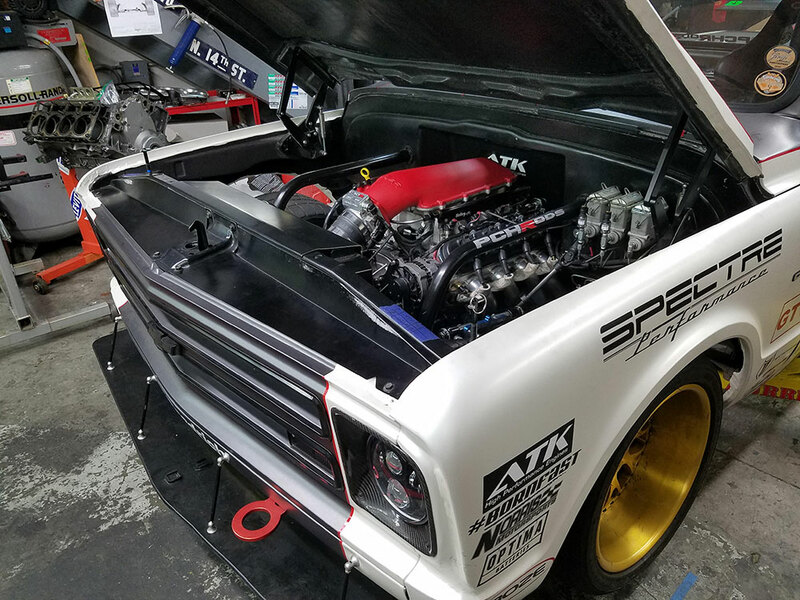 The Spectre-sponsored C10R would be competing at the NMCA West June event for the first time with its new 383 cubic inch stroker motor. Since its debut at the 2014 SEMA Show in the Spectre Performance booth, Phillips and the C10R have participated in events such as the NMCA West Hotchkis Autocross, Goodguys Autocross, SCCA, and the Optima Series. The first year was spent sorting the truck, testing the prototype suspension, and working out the bugs. When reflecting on that year, the truck had great success overall, earning awards at several race events and car shows. During Phillips participation in the 2015 Optima Ultimate Street Car Invitational she noted a lack in horsepower on the track portion of the event. This lead Phillips to questioning if the C10 would ever be as competitive as some of the other vehicles she competed against including C2 and C3 Corvettes, first and second gen Camaros, and various other classic muscle cars. Since there are only a handful of trucks running the pro-touring race circuit, many of the events that Phillips participates in do not have a designated truck class. Instead, the C10R typically competes in the Classic Muscle Class, which includes various years of older vehicles (each event includes a different year range). In order to get the C10R on the podium, Phillips recognized that she needed more power. "We've sorted through the truck and its handling capabilities are very comparable to that of a first gen Camaro, but we were lacking power, which was hurting us on big course events," Phillips commented. The complete motor install will be featured in an upcoming issue of Street Trucks magazine's Builder Guide. Luckily her needs were answered when ATK Performance engines teamed up with PCHRODS, working together to build a new, bigger motor allowing Phillips to not only increase horsepower, but also increase torque. 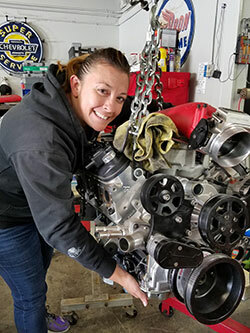 The result was a freshly built 383 cubic inch stroker motor that would allow Phillips to keep up on the straightaways at big course events in addition to more torque to help off the starting line and around the corners on an autocross. The NMCA West Hotchkis Autocross at Auto Club Dragway in Fontana, California would be the first race event with the new motor. Last year Hotchkis Autocross event coordinators, the Racing Byrds, announced a Truck Class, which would allow Phillips to compete against other trucks over the two-day event. This class typically includes a handful of Silverado's, some El Caminos and any other makes and models of trucks that wish to compete. It was difficult for Phillips to predict how the weekend would fair considering the unbearable temperatures and a freshly built motor. Friday was used as a test and tune, making sure the motor ran smooth and the suspension was dialed in. Once Phillips and her crew confirmed that the truck would be ready for Saturday's race, it was time to focus on the track, memorizing the course and finding the right driving line. "The difficult thing about driving a truck is that the line is not always the same as it would be for a Camaro or a Corvette. The truck is much wider than both, which can present problems around turns and through slaloms," explained Phillips. "Sometimes I even question myself how I get through the maneuvers out of course. 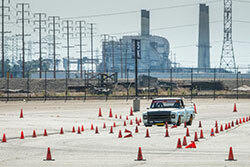 Luckily the truck likes to dance around the cones as I keep my fingers crossed not to hit cones. I am told I like to kiss cones, which can result in a two-second penalty per cone if I am not careful." Phillips did exceptionally well throughout the weekend, considering the track was fast, but extremely technical. The Hotchkis Autocross recognizes participants both Saturday and Sunday, though Sunday concludes the overall awards throughout the weekend. Phillips participated in the two-day event, running a total of ten laps each day. Once ten laps were complete and times were in Saturday evening, it was announced that Phillips maintained an almost three second lead over second place, earning her a win in the Truck Class. 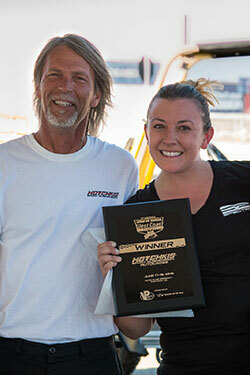 Spectre Driver Brandy Phillips took first in the Truck Class both Saturday and Sunday, in addition to placing 17th overall among forty-three drivers. Sunday would present itself with a new set of obstacles as Phillips struggled to keep the C10R running throughout the day. Problems with the tune kept the truck from idling at the start and finish. Phillips fought a hard battle throughout the day as they made small adjustments each session out, though her times were not improving. It was not until the last session of the day when she gave it everything she had left in her and the truck, resulting in her fastest time of the day. Phillips had managed to put herself a full second ahead of second place Mike Sullivan in his 1965 El Camino. Phillips would return to the podium once more Sunday evening to receive her second Truck Class win for the weekend. When Phillips was asked what she attributed her win to, she credited her crew, which consisted of several family and friends that weekend along with her amazing sponsors and everyone who has supported the PCHRODS C10R along the way. "I am always amazed at the following my truck has. We had a rough start to our race weekend that resulted in us breaking down on the side of the road Friday morning while heading out to Fontana," acknowledged Phillips. "A cop pulled over, though his initial conversation did not include asking us if we were okay. Rather, he wanted to know if that was the truck that was on YouTube. Though I was a little disappointed that he was not there to help, I was flattered that he knew the truck and stopped to check it out." The Spectre Performance sponsored C10 has had great success over the past two years. Regardless whether Phillips is in first or last, one thing is for sure; it will always have a following that supports not only the C10R, but also Brandy Phillips. She added that if you are ever in the area and attend a race event she is participating in, feel free to ask for a ride. The passenger seat is definitely one way to get a first-hand look at just how hard it is to maneuver a 4,000lb brick through a parking lot filled with cones. Phillips is proud to represent Spectre Performance throughout the 2016 race season. To learn more about her and the C10R or other Spectre Performance sponsored drivers, sign-up for the Spectre Performance newsletter today.